We typically only make Spritz Cookies at Christmas time, but they are so flavorful and delicious that they really could be made any time of the year when you are wanting a soft, sweet little delicate cookie treat! Spritz cookies are traditional Christmas cookies in Scandinavian countries and are simple butter cookies, shaped by putting the dough through a cookie press. The spritz guns or presses come in a variety of styles. Some are manual and some are electric and include a number of little shape disks; many of mine that have never been used. I have a vintage electric spritz cookie press that we cherish around the holidays. I think that I purchased it when I was in our first apartment and it’s box is covered with tape to hold it together. The old price tag (the stick on kind that they don’t really use any more) from Target reads $12.99. We’ve mastered the recipe after years of trial and error. We recently made a big batch and were pleased to donate them to friends who delivered them to the homeless on Christmas eve at a shelter downtown Minneapolis. Try these! In a large electric mixer bowl, cream butter & shortening until creamy. Gradually add sugar and beat until fluffy. Add the egg and beat well. Stir in vanilla and gradually add sifted flour to the mixture, beating well after each addition. The perfect cookie lies in the dough, which should be neither too soft nor too firm. It it is too soft, the cookies will have no definition while flattening out and if the dough is to firm, the cookies will bake hard and will be too dry. 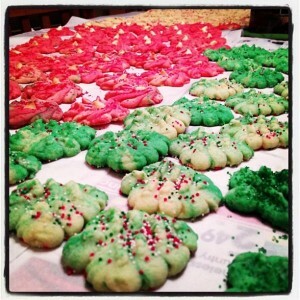 Clean the cookie sheet off between batches and allow the sheets to cool so that the shapes of dough adhere. Sprinkle with colored sugar or balls! Bake at 350 degrees for less time than you think! Watch them and depending on your oven, seven to 12 minutes or until barely golden brown on the bottom.